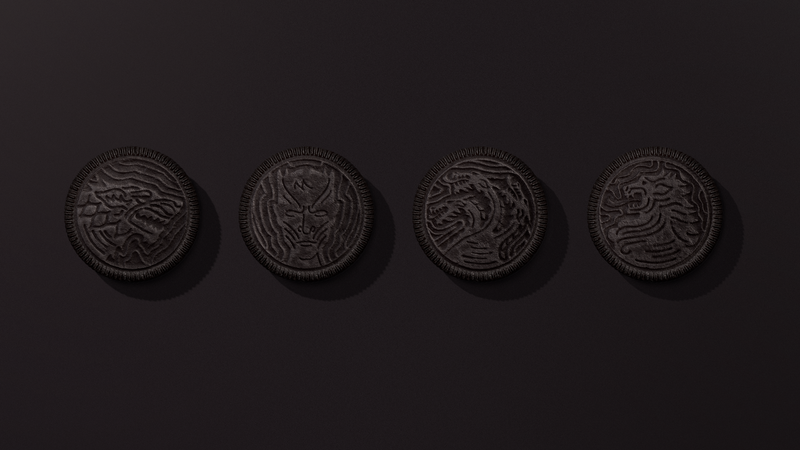 A few weeks ago, the rumors were flying regarding Oreo's possible collaboration with HBO and Game Of Thrones. With the final season of the celebrated show premiering this month, Game of Thrones has been unveiling a handful of major partnerships to ring in the new era. We've seen the show team up with Mountain Dew in the last few days and now, Oreo has officially come through with their exclusive GoT themed snacks. These aren't just regular Oreo cookies. While the taste will remain intact, the limited-edition pack will come with four different designs on the outer layer, embossing each Great House still battling for the Iron Throne. A commemorative box will also be holding the cookies in place, which features a sleek theme and the Game of Thrones font. The exclusive boxes will be available starting April 8 but if you want them, you should probably be quick because they will only be produced in limited quantities. However, this is expected to be one of Oreo's largest limited releases ever. If you're suddenly hungry after watching the title sequence below, check out our brand new Snack Review segment where artists like RiFF RAFF and Kid Buu have stopped by our office to rate their favorite munchies. Game of Thrones premieres on HBO on April 14.